The light gold Leica C-Clutch Case fits the Leica C digital camera. This stylish clutch-style accessory features two separate compartments to offer additional space for a smartphone and small change. It is made of soft, suede-like premium Alcantara with a sandblasted metal closure. Box Dimensions (LxWxH) 9.4 x 5.2 x 2.1"
C-Clutch Case for Leica C Digital Camera (Light Gold) is rated 5.0 out of 5 by 1. Rated 5 out of 5 by James from Gorgeous & Functional When I got my wife a Leica C for travel, I got a C Pouch, but wanted to get her something special as well. The outside of the C-Clutch is a matte black with a reddish sand-blasted metal disk embossed subtly with the Leica logo. Made from a hard-wearing synthetic, it's hard to imagine it's not suede. 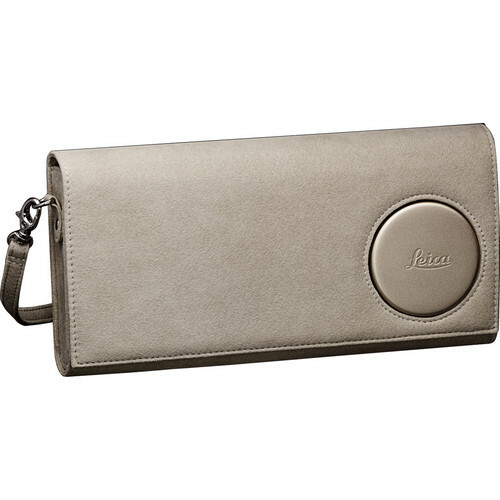 The C-Clutch is a well-made luxury clutch purse with a dedicated section for the Leica C camera as well as enough room for a smartphone, keys and a small card wallet.